The Nevada Test Site (NTS), 65 miles north of Las Vegas, was one of the most significant nuclear weapons test sites in the United States. Nuclear testing, both atmospheric and underground, occurred here between 1951 and 1992. After World War II, the U.S. government established the Atomic Energy Commission (AEC) to monitor the peacetime development of atomic science and technology. The 1950s became a period of rapid expansion for U.S atomic weapons. Fear of the Soviet Union increasing their atomic weapons, and the belief that building up nuclear arms could help establish U.S. power, contributed to this rapid expansion. In 1950 the AEC considered many sites for U.S. nuclear weapons development and effects testing. They then selected the Las Vegas Bombing and Gunnery Range. On December 18, 1950, President Harry Truman authorized the establishment of a 680 square mile portion of the Range as the Nevada Proving Ground. Under the authority of President Truman, the AEC then designated, and managed, this land. In 1955, the name of the site was changed to the Nevada Testing Site. Overtime the site rapidly grew in size. The NTS acquired more land for testing in 1958, 1961, 1965, 1967, and in 1999. 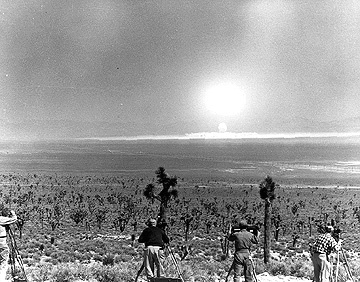 On January 27, 1951, nuclear testing at the NTS officially began with the detonation of Shot Able, a 1-kiloton bomb, as part of Operation Ranger. Between 1951 and 1992, the U.S. government conducted a total of 1,021 nuclear tests here. Out of these tests 100 were atmospheric, and 921 were underground. Test facilities for nuclear rocket and ramjet engines were also constructed and used from the late 1950s to the early 1970s. The AEC originally intended for the NTS to be a testing site where quick experiments could be conducted with small scale nuclear bombs. The results ideally would then lead to the development of bigger atomic bombs and advanced thermonuclear weapons. In reality, largescale atmospheric tests became common and lasted for nearly 12 years. 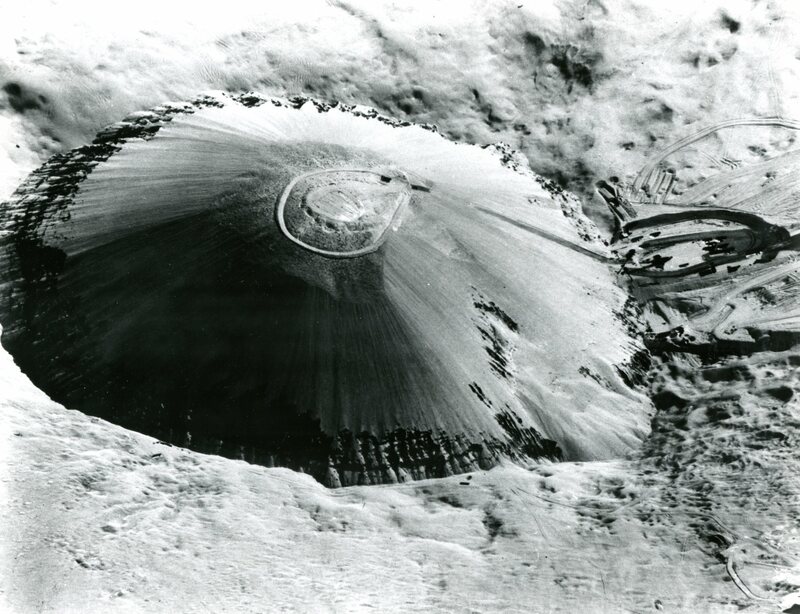 Underground nuclear testing began at the NTS with Operation Nougat in September of 1961. The Armed Forces Special Weapons Project (AFSWP) originally planned underground tests to be conducted on the island of Amchitka off the coast of Alaska. This changed after the creation of NTS, when the AFSWP decided they wanted to test in Nevada in order to develop a more comprehensive map of fallout. One example of the test series was Operation Plumbbob. The U.S. military conducted Operation Plumbbob from May 28 to October 7, 1957. 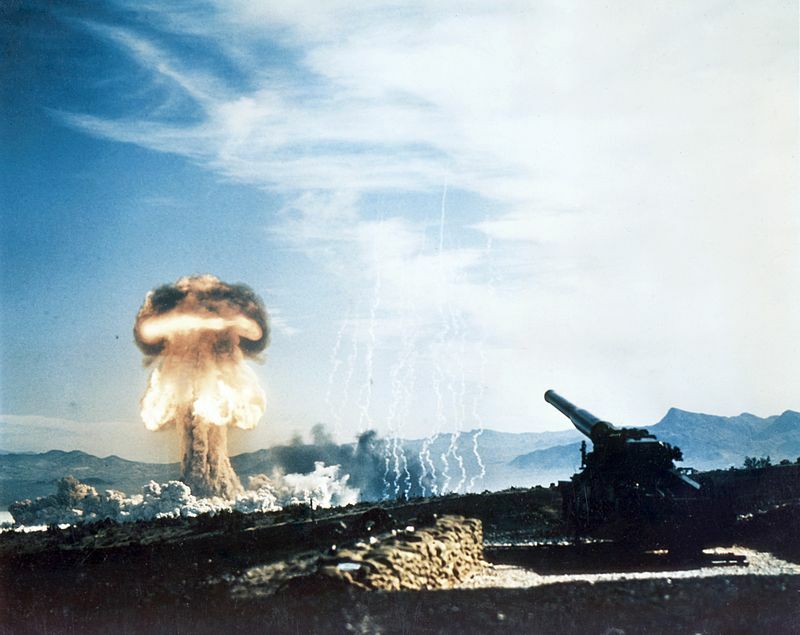 This series of 29 nuclear tests was one of the longest and most comprehensive test series, and it became controversial after much of the operation was declassified. There were several goals during the Operation such as: improving weapon design, safety testing, conducting bio-medical experiments, and testing designs for thermonuclear systems. Plumbbob released large amounts of radioiodine (I-131) into the atmosphere producing about 32% of all civilian exposure due to atmospheric nuclear tests. About 3,000 servicemen were also exposed to high levels of radiation during Shot Smoky. Mushroom clouds from the atmospheric tests could be seen up to 100 miles away in the distance. This led to increased tourism for Las Vegas, and throughout the 1950s and early 1960s the city capitalized on this interest. Many guests could see clouds, or bursts of light from hotel windows, and the hotels promoted these sights. 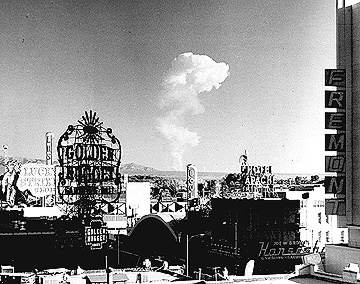 Some casinos also hosted “dawn parties” and created atomic themed cocktails, encouraging visitors to view the tests. Calendars throughout the city also advertised detonation times, as well as the best viewing spots to see flashes or lights or mushroom clouds. 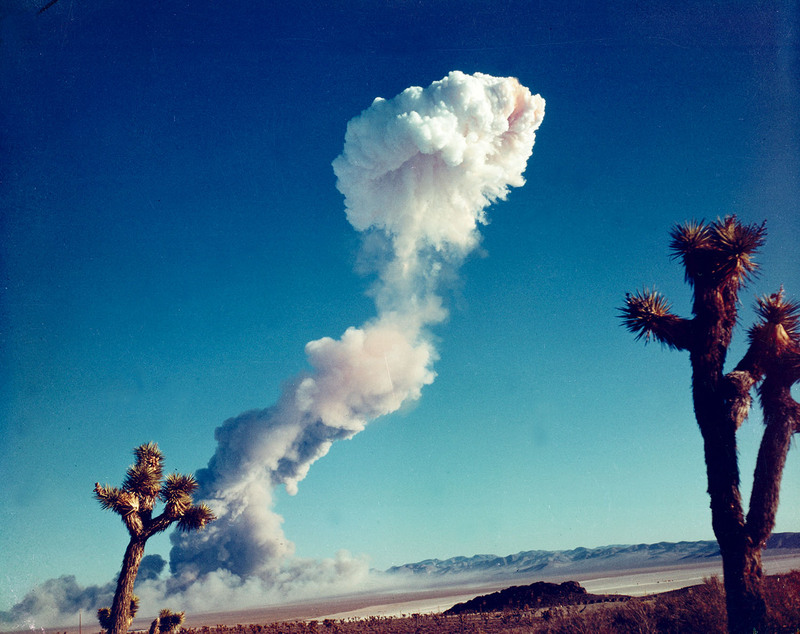 The atmospheric nuclear tests caused concern about potential health effects on the public, and environmental dangers, due to nuclear fallout. As a result, the last atmospheric test occurred on July 17, 1962. On August 5, 1963, President Kennedy, along with the United Kingdom and the Soviet Union, signed the Nuclear Test Ban Treaty. This prohibited nuclear weapons tests and nuclear explosions underwater, in outer space, and in the atmosphere. Underground testing was still permitted if no debris were to fall outside the boundaries of the nation conducting the test, so this testing continued at the NTS. The Treaty was also meant to encourage disarmament among these nations. There have been various debates over how much radiation exposure and nuclear fallout were caused by tests conducted at the NTS. Health issues suffered by individuals exposed to radiation from the NTS has become a controversial topic. Some critics believe the government always knew of potential dangers and health risks that radiation could cause to those who lived near the site. Others argue that the test site brought in revenue to Nevada and created economic benefits for the state, and that the government was not fully aware of the health risks. When the testing began the U.S. government was confident that meteorologists could predict weather and wind patterns to help prevent radiation from spreading. However, recently unclassified documents have revealed that fallout from the tests drifted across most of the U.S. St. George, Utah is one major example of this. Wind currents caused residents of Utah to be affected by radioactive fallout. Particles that spread, such as iodine-131, can enter the body through contaminated food, drinks, or air, and eventually lead to cancer or birth defects. While the testing occurred, especially in the 1950s, residents did not know of possible health risks. People had picnics at high points to watch the tests. Nuclear fallout was not clearly understood. Cancer rates in this area increased from 1950 to 1980, and many citizens of St. George now believe that the testing has caused deaths, cancer, and a variety of health issues in their families. In 1990, Congress passed the Radiation Exposure Compensation Act to make payments to some of the people who claimed to have been affected by the fallout from the nuclear tests, but these payments are only available under a limited set of conditions. The individuals and communities who were exposed to nuclear fallout throughout Arizona, Nevada, Utah, Oregon, Washington, and Idaho are now called “Downwinders.” For more on the Nevada Test Site Downwinders, click here. A study done in the 1990s determined that soldiers who witnessed testing at the NTS were more likely to either be diagnosed with cancer, or to die from cancer, later in life. These soldiers have a higher than normal death rate from leukemia, nasal cancer, and prostate cancer. Specifically, soldiers at NTS had a death rate for leukemia that was 50 percent higher than other groups of military personnel who did not work with atomic testing. Both veterans and civilians are split over the legacy of the NTS. Many veterans of the testing do not believe any health issues have occurred due to their work, and claim that the government did not know about the potential dangers. Others have negative feelings. Recently, some veterans have spoken out about health problems, which they believe are a result of their work with nuclear testing. The National Association of Atomic Veterans was formed in the 1990s to help raise awareness of both the work and health concerns of the atomic veterans. Many veterans also hope to be recognized for their work and sacrifice as atomic veterans. Suggestions to create a National Atomic Veterans’ Day, or to create service medals for atomic veterans have been proposed, but have not been successful. The last underground nuclear test occurred on September 23, 1992. In 2010, the NTS was renamed the Nevada National Security Site (NNSS). The site is no longer used for nuclear weapons testing, but it is still used for U.S. national security needs. If deemed necessary, the site could be authorized again for nuclear weapons testing. The NNSS is now the preferred location for National Nuclear Security Administration defense programs, industry research, and development efforts. The National Environmental Research Park is also located at this site. Both federal agencies and private industries conduct open air experiments here, focusing on emergency response techniques and test remediation. For example, the Department of Homeland Security conducts nuclear and radiological emergency response testing and training. The NNSS can be visited through monthly tours offered by the site. Those interested in learning more can also visit the National Atomic Testing Museum in Las Vegas, where the history and lasting effects of the NTS are presented. 1/27/1951: Testing begins with Shot Able. 4/22/1952: Shot Charlie is conducted. Charlie was part of the Desert Rock IV exercises, where thousands of military personnel trained to simulate activity on a nuclear battlefield. 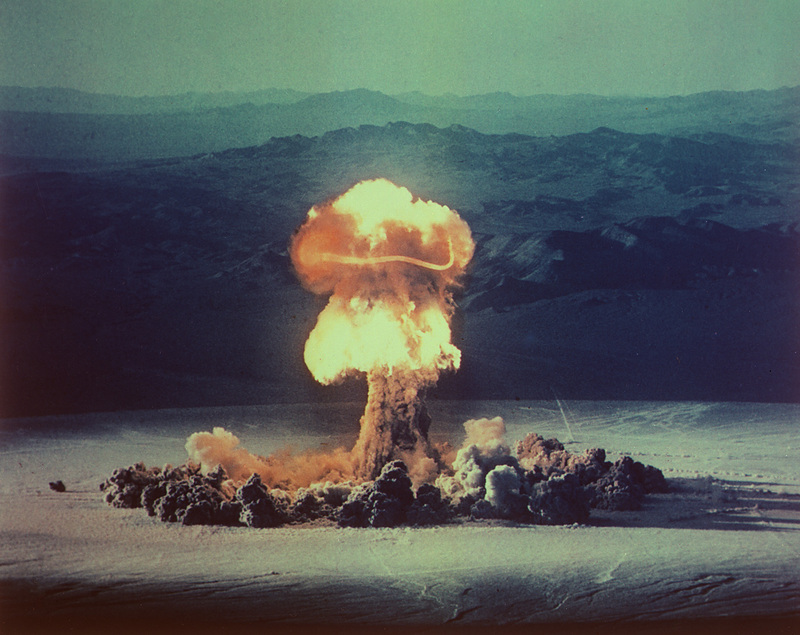 3/17/53: The "Annie" nuclear test is conducted. A wood-framed house was built for the occasion as part of a civil defense study on the effects of a nuclear explosion. 5/19/1953: The "Harry" test is conducted. Due to an unexpected change in the wind, "Harry" caused the highest amount of radioactive fallout of any test in the United States, contaminating the city of St. George, Utah. The test was later called "Dirty Harry." 3/12/55: Shot Hornet is conducted. It was the fifth of 14 tests in the Operation Teapot. Operation Teapot was designed to test new kinds of fission devices. 5/28/1957- 10/7/1957: Operation Plumbbob nuclear test series occurs. 9/6/57: The Coulomb-B Shot safety test is conducted during Operation Plumbbob. Coulomb-B was intended to make sure that an accidental detonation of conventional high explosives in a nuclear device would not cause a nuclear reaction. 12/6/57: The Coulomb-C Shot safety test is conducted. The test yielded an unexpectedly high amount of 500 tons, leading to public concern over nuclear fallout. 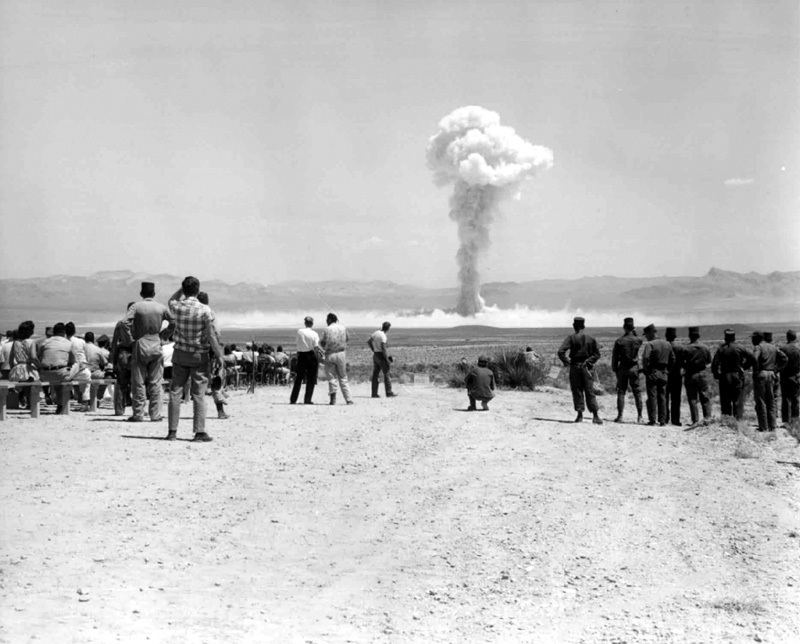 10/16/1958: The Shot Dona Ana nuclear test is conducted. It was part of the Operation Hardtack II series, in which the United States conducted 37 nuclear tests. 12/8/68: The Schooner nuclear test is conducted underground. "Schooner" was also part of Operation Plowshare, an effort to use nuclear explosives for peaceful construction purposes. 9/23/1992: The U.S. conducted its last nuclear test, code named Divider, at an underground facility in Nevada. It was the last of the 1,032 nuclear tests carried out by the United States since The Trinity Test 47 years earlier.